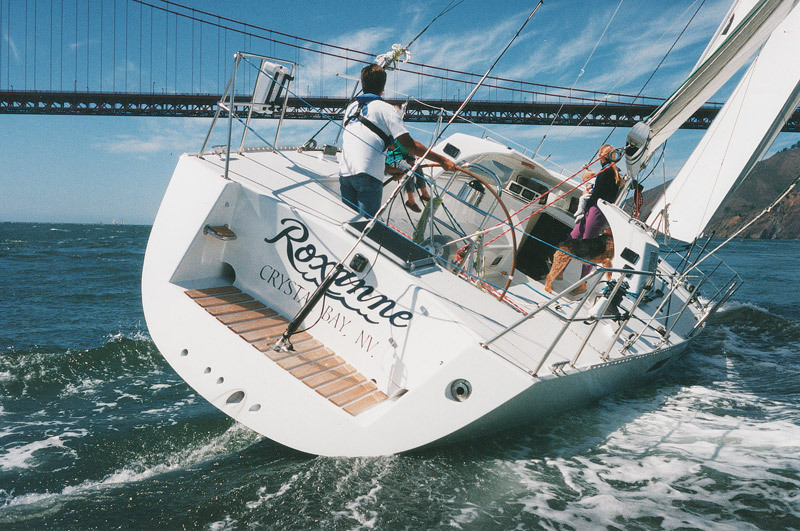 Roxanne is a fast 60′ (18.3m) family cruiser, designed by Tom Wylie and built of aluminum and composites. She was launched in 1996. 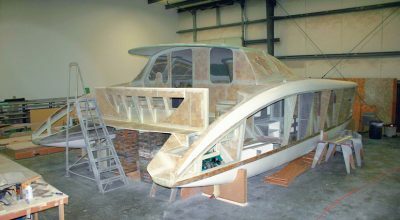 Editor’s Note: The following article first appeared in Professional BoatBuilder issue No. 129. 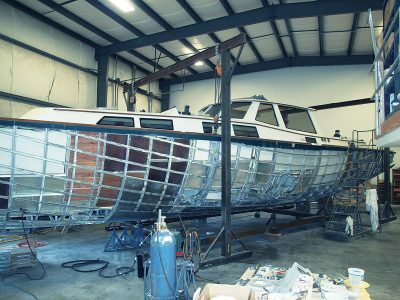 It is one of a series we’ve published since the Great Recession of 2008, profiling boat builders who have managed to stay in business despite challenging economic circumstances. 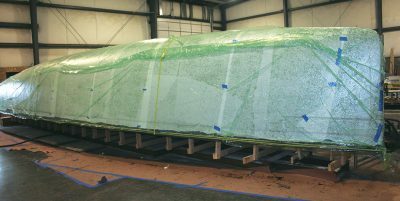 When I visited builder Dennis Choate last spring in Long Beach, California (see “Survivor,” Pro­fes­sional BoatBuilder No. 126), our conversation naturally focused—for a few minutes anyway—on other West Coast shops specializing in high-performance sailboats. There aren’t many. Besides Choate’s Dencho Marine and Westerly Marine in Southern California, we named Schooner Creek Boat Works (Portland, Oregon) and James Betts Enterprises, whose last known location was in Truckee, California, on the Nevada border. What was he doing there, anyway? Last we’d heard, there had been a problem with a big boat, and he’d moved. Back home, I decided to track him down. Thanks to the Internet, it was easy. For the past five years, Betts has been in Anacortes, Washington, working out of several buildings in a small industrial park just over the bridge that spans the Swinomish Channel, a thin strip of salt water separating Fidalgo Island from the mainland. In the reality show that is just about every small builder’s fate, fact is often stranger than fiction, and certainly less just. And like the reality shows on television pitting ordinary folks against nature and each other, the tough, resilient guys like Choate and Betts keep coming back. Why? Because it’s what they know how to do, and what they love: making things, especially boats. Peppermint Patty, the 25-footer (7.6m) in the foreground, was Betts’s first build. Designed by Nelson/Marek, she has an aluminum hull and plywood/glass deck. When it was bought in 2007 by mining giant Rio Tinto, Alcan, based in Montreal, Canada, was the third largest producer of aluminum in the world. Today, operating as Rio Tinto Alcan, it’s the largest. When Fortune magazine named it one of “America’s Most Admired Companies,” it hadn’t asked Jim Betts. Or the owners of Kvichak Marine (Seattle, Washington) and Nichols Brothers (Freeland), and others who had built boats with defective alloy made by Alcan. Betts says he is but one of about 50 companies that built hundreds of boats from defective 5083-H321 aluminum plate. Jade, a 68′ (21m) Tom Wylie design, was built of aluminum that, later, was found to be defective; the owner sued Betts, who eventually obtained ownership of the boat. Over the past few years, he’s removed the old plates, and is now welding new ones for a waiting buyer. Betts says Alcan had manufactured 775,000 lbs (351,534 kg) of the bad 5083, and that the problem went unnoticed until boats built by Kvichak Marine and Nichols began corroding. Those two yards hired metallurgists, who eventually figured out the problem: the alloy hadn’t been processed at a sufficiently high temperature during the stabilization stage. Maverick, a 70′ (21.3m) aluminum and carbon racer designed by Nelson/Marek, was relaunched in 1993 after a remodel. Betts’s one build with the material was a beautiful 68‘ (21m) cruising sailboat designed by Thomas Wylie (Canyon, California). Launched in 2000, the owner cruised Jade to Alaska and Mexico before learning of the potential disaster beneath him. In brief, he sued, Betts settled (barely managing to avoid bankruptcy), and, once the dust cleared, Betts ended up with the boat that nobody wanted. In his new shop in Anacortes, Betts has spent his spare time—when he’s had any—nibbling the old skin off. That’s done, and now he’s replating the hull. Fortunately, the frames, stringers, and other structural members were all fabricated from 5086, and are in excellent condition. Jim Betts was born in 1952 in Port Hueneme, on the coast of California, just north of Los Angeles. His father was in the service then, and later worked for the County of Ventura. His mother was an X-ray technician in a doctor’s office. The family spent summer vacations camping and water-skiing, but on weekends the rest of the year they were at local motocross tracks. During high school, Betts worked on and raced motorcycles, eventually ranking number 54 in Southern California. In 1971 he started in business with a portable welding rig and followed the company he was working for to Tahoe City, California. He met his wife, Janis, there, and the two were married in 1979. She is from San Diego, so they spent a lot of time traveling between the mountains and the coast. One of Betts’s few forays into series production was the Sierra 26 (7.9m) one-design, built of pre-preg carbon and honeycomb composite, post-cured over an aluminum tool. Just two were built. “I got involved with George Olson [of Santa Cruz, California] when he was developing the Pacific High prototype for the [ultralight] Olson 30 [9.1m],” Betts remembers, “and I actually bought the first Olson 30 that he sold. I was his first paying customer but wanted a dark green hull, so I ended up with hull No. 2. George was very quiet, but his creative genius provided the inspiration for my future career. At that time, Santa Cruz was the center of the ultralight universe. Earlier, George worked with Ron Moore, who built Grindel, one of the original ultralights [see PBB No. 93, page 17]. The plug from Grindel was chopped and wedged apart by George and Ron, and they built a mold that became the Moore 24 [7.3m]. His other dalliance with production boatbuilding was the Farr 36 (10.9m). 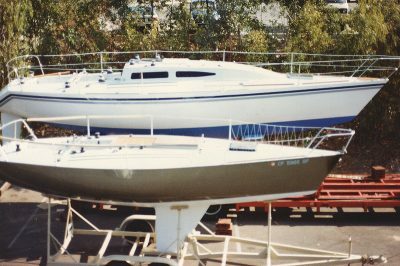 When Carroll Marine (Bristol, Rhode Island) went out of business in 2003, Farr Yacht Sales contracted Betts to take over production. It seemed like a sure thing. After all, Jeff Stagg at Farr Yacht Sales had sold 100 Farr 40s and several hundred Mumm 30s. But three boats in three years were not enough to justify the additional overhead, so the prospect of a lucrative model line ended there. It seemed to Betts that interest in one-design racing had peaked, and was winding down along with the economy. 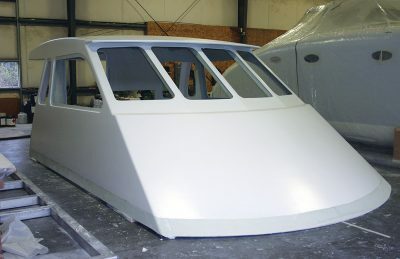 Other than high-performance sailboats, Betts has done a few powerboat builds such as this 78′ (24m) SWATH, which rides on submerged torpedo-like hulls for improved seakeeping. Their construction in aluminum is shown below. Betts’s welding background has opened the door to a variety of projects that might not have presented themselves if he’d been limited to composites. Surely that was the case with the 78‘ (24m) SWATH he built in 1985 for SWATH Ocean Systems (SOS, in Chula Vista, California). SWATH is the acronym for Small Waterplane Area Twin Hull, in which about five-sixths of the smooth-riding catamaran’s buoyancy is in two submerged torpedo-like hulls, or tubes, well below the surface in calmer water. The semi-submerged hullform was invented by Frederick Creed, a Canadian, who obtained a British patent for the concept in 1946. Since the 1960s, a number of SWATH projects have been completed, ranging from the 430‘ (131m) Radisson Diamond cruise ship to a 26-knot passenger ferry, four U.S. Navy acoustic surveillance ships, and in 1993, Sea Shadow, a 164‘ (50m) so-called stealth ship built by Lockheed Missiles and Aerospace Company. Betts says his commission from SOS was a “huge upswing for our business.” He built the aluminum structures up to the deck. The superstructure was built by Larry Drake, of Long Beach, whose Drake Craft Boats built sportfishermen in plywood, sheathed in fiberglass. The parts were married at Shelter Island. 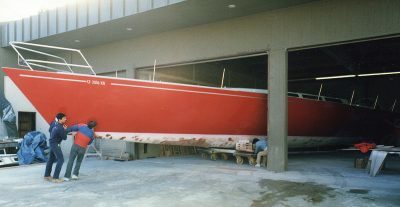 Chubasco later was donated for service at the 1988 America’s Cup in San Diego, where it served as the committee boat. 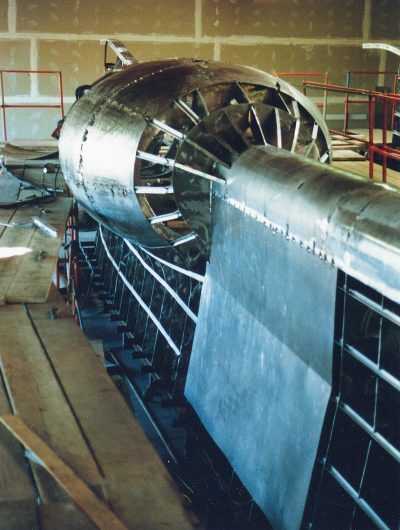 Construction of the torpedo-like SWATH hulls in aluminum. 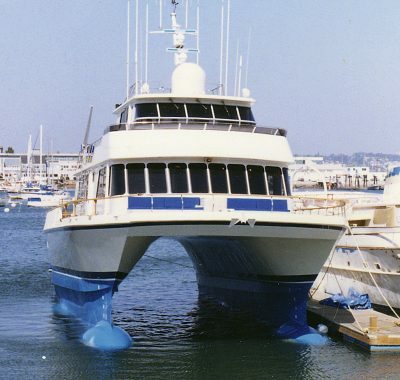 In 1995, Betts built Beowulf VII, a 79‘ (24m) Sundeer, for Steve Dashew. Hull and deck are aluminum. It was Betts’s first build after elimination of the onerous luxury tax that had brought yacht building almost to a standstill in the early ’90s. The next year he built his third boat to a design by Tom Wylie, for whom Betts holds considerable respect. Roxanne was 60‘ (18.3m), built of aluminum and composites. 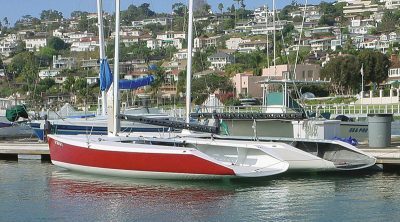 Betts had a nice string going in the mid-1990s: next up was the Reichel/Pugh 75 (23m) Zephyrus, a carbon/epoxy high-performance sailboat. That same year, 1997, he built White Eagle to a Bob Perry (Tulalip, Washington) design in aluminum and composites. 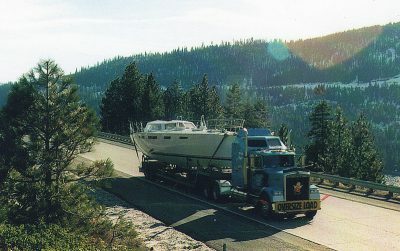 Built in Betts’s shop in the mountains on the Nevada-California border, White Eagle, a Bob Perry design, heads over Donner Summit in 1997 toward the ocean. 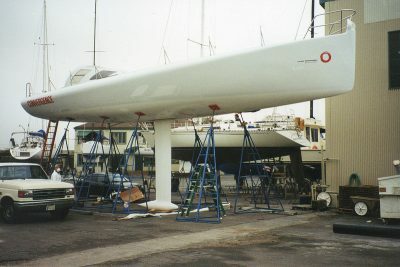 The 39′ (12m) Bien Roulée, an Alan Andrews–designed racer, seen above on the male plug, was built in 2007 of carbon and Corecell. Betts works only with epoxy resins, citing their environmental and structural advantages. Next was an Open 50, Conver­gence, that Bob Gay hoped to enter in the 2000 Vendée Globe around-the-world race. (See “Recent Work,” PBB No. 65, page 24, for more on Convergence.) The designer was Jim Antrim (El Sobrante, California), and the name derived from the convergence of design elements Antrim developed to minimize the chance of inverse stability, a problem with the open-class boats due to their extreme beam and flat bottoms. He incorporated a large coach roof, cambered decks, and a large radius to the hull–deck join to reduce the waterplane area when upside down. The Bien Roulée turned right-side up with the sail drive foundation installed. When the sponsoring company, Ascend Communications, was bought by Lucent Technologies, corporate interest in the project flagged. She was renamed Everest Horizontal, and Tim Kent successfully circumnavigated on her in the 2002 Around Alone race. The new century opened with construction of the aforementioned Jade, and Betts’s foray into production boatbuilding with the Sierra 26 Nelson/Marek design; a few carbon/Corecell racers, including three Farr 36s; and the 39‘ (12m) Alan Andrews–designed Bien Roulée. Turning to developments in core materials, we noted that some segments of the composites industry are trending away from cores in favor of single-skin carbon and toughened epoxy resin systems. Betts acknowledges the other, emerging school of thought regarding cores: designers today can look at a wide variety of options with finite element analysis software and weigh the trade-offs between a thick-cored hull, shell-style structure with limited framing, versus the much more labor intensive thin-cored hull shell with the panel loads supported by lots of transverse frames and stringers. Convergence, an Open 50 that sailed in the 2002 Around Alone race under the name Everest Horizontal, is one of two composite boats Betts has built with balsa core—in this case, to provide buoyancy and withstand post-cure temperatures. Three weeks prior to my visit, Betts launched his first sailing catamaran, a Craig Schionning design called the Spirited 380 (11.7m). It’s an Australian kit boat; the American buyer hired Betts to put it together. Designed to ship in a 40‘ (12.2m) container anywhere in the world, all parts are computer-cut flat panels that are resin infused. 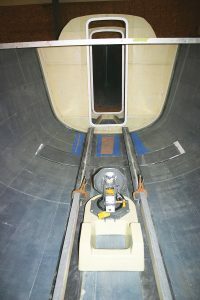 The hull bottoms (2.4‘/200mm high) receive the bulkheads in the correct position; this method, which Schionning calls the Spirited Assembly System, or SAS, makes the entire project a reasonable undertaking for a do-it-yourselfer. Hull topside panels are added later. Most structural parts are balsa-cored, while interior furni­ture is cored with a type of paper honeycomb. Betts used epoxy resin throughout, noting that the boat is very light and strong. Buzz Ballenger in Watsonville, California, built the rig (see PBB No. 94, page 10). A recent project was the Spirited 380 (11.7m), a cruising catamaran kit from Australia. Designer Craig Schionning designed it for amateur builders, though Betts’s client opted for professional help. Like Convergence, it, too, is balsa-cored. If variety is the spice of life, diversity is often the secret to success, and Betts has tried his hand at a number of nonmarine projects. In 2008 he was approached by a software developer, from Bainbridge Island, who wanted to start a company manufacturing a small electric car. He’d bought a 25-mph (40-kmh) electric car from a Seattle company; it had an ABS body and aluminum frame, which he thought could be improved on. Also the owner of a Santa Cruz 52 (16m), he naturally turned to a boatbuilder for quality construction of his prototype vehicle. For a design, Betts’s client visited several firms in California, which told him to bring a million bucks and they’d get started. As it happened, Betts’s son Kellen had completed a research project at the University of British Columbia in Vancouver, and had some time available. Over the years, he’d done the computer lofting, patternmaking, and drafting for the shop, and was commissioned to design the auto­mobile in-house. “We started from scratch. The client wanted it to be a little sedanish…not just a two-seat vehicle,” Betts says. “This has a back seat; 35 mph [56 kmh]; all carbon. The suspension was made in Michigan to hook to our differential drivetrain; that was the only thing we didn’t make. 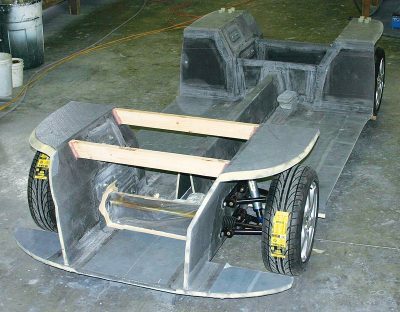 We had a rolling chassis that weighs a third of a steel frame and metal body. The body and chassis are all carbon composite. It drives like a little racecar, and has a 130-mile [209-km] range with its Evergreen ECH lithium battery and German electric motor. Betts’s son Kellen designed this electric car for a client on Bainbridge Island, Washington, who wanted to series-produce it under the Neighborhood Electric Vehicle Law, which doesn’t require crash testing. The NEV speed limit is 35 mph (56 kmh), though it can go faster. 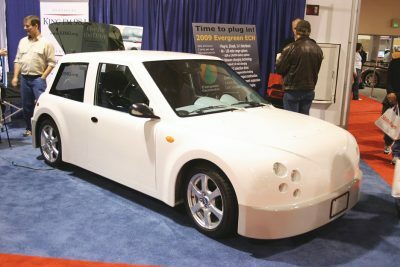 The electric car was exhibited at the 2009 Seattle Auto Show; the body and chassis are carbon composite. The car was exhibited at the 2009 Seattle Auto Show and well received. But when Nissan announced its Leaf, and Toyota an all-electric successor to the Prius, and venture capital seemed less interested in the Neighborhood Electric Vehicle niche market, the client decided it was time to get back to earning a living. A year ago, Betts had a contract to build the composite superstructure, and carbon/composite hydrofoils, for a low-wake ferry now in service on Puget Sound. Like many builders, he added staff for a project, only to let most go when it was finished and comparably sized jobs failed to materialize. Survival projects include a new bottom for a Santa Cruz 27; production carbon rudders for the Flying Tiger 10M one-design; and a Jim Antrim–engineered V-boom for a Catana 52 cruising multihull that was delivered from Europe to Nanaimo, British Columbia, on Dockwise. Betts got the job through friends at North Sails. and cleaning with Scotch-Brite. It took more hours than the original construction. As part of the legal settlement, all the plating, even the dust, had to be collected and shipped for recycling to ensure that it would never be used again. But Betts has a buyer for the boat, and the eventual sale will signal the end of the long and difficult trial—of patience, tenacity, and tight bookkeeping. Betts was polite with each. “Not now.” He’d shake his head. “But check back.” He’s got bids out on a number of projects, and if one or more comes through, he’ll be saying yes. He readily admits, “We’ll do anything.” But it takes more than humble pie to keep a business going. One also has to mind the till. Leaving California was another strategic move that helped the balance sheet. Life at 7,000‘ (2,134m) was good when the kids were young and could ski out the back door. But when their daughter Emily went off to school at the University of Washington, Jim and Janis were ready for a change, too. While the dozens of great boats Betts has already built, and will build, are a worthy legacy for any builder, knowing he’s got kin following with a similar work ethic just might be more satisfying. 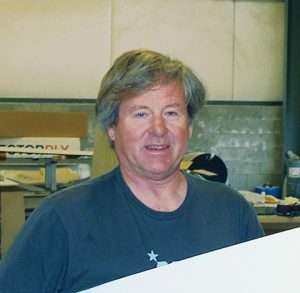 About the Author: Dan Spurr is Profes­­sional BoatBuilder’s editor-at-large.